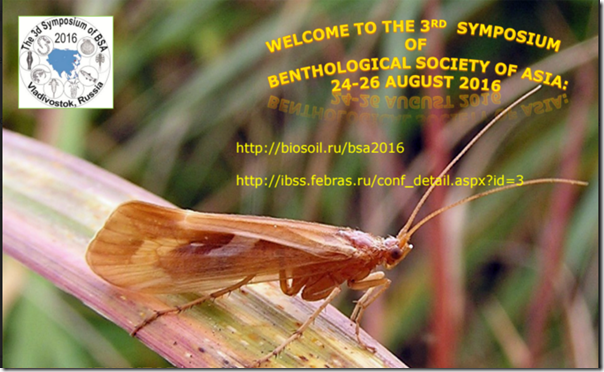 The 3rd International Symposium of the Benthological Society of Asia will be held on August 24–26, 2016, at the Far Eastern Federal University (Vladivostok, Russia). The main goal of the Symposium is to summarize knowledge in different branches of freshwater ecology in Asia, combine efforts in protection of fresh waters, and strengthen international cooperation in the Asian region. Biostation "Vostok" of Institute of Marine Biology (near Nakhodka City, Russia). The goal of the Youth School to provide a platform for training of young scientists, students and even school students to attract their attention to freshwater problems and to teach them modern techniques of freshwater bioassessment. Marine Biology (Far Eastern Branch of the Russian Academy of Sciences). included in the Second Circular and will be found in the near future on www.biosoil.ru/BSA2016. and the following 1st Youth Benthological School in Vladivostok; we look forward to seeing you there!